In the grounds of Moriah Chapel stands a column commemorating the 1904-1905 Revival and one of its most significant figures, Evan Roberts (1878-1951). The column was erected in 1953, to commemorate the Revival’s 50th anniversary the following year. Evan Roberts was born in 1878, not 1879 as inscribed on the memorial. COMMUNITIES ON THEIR KNEES! WHAT IS THIS? THE OPENING OF THE HEARTS OF THE ORDINARY PEOPLE. FOR REMEMBERING THE DUST OF THE EARTH. God loves you. Therefore Seek Him diligently, Pray to Him earnestly. Read His Word constantly. The words “Gloria Deo” on the side of the memorial remind us that the glory for the Revival should be given to God, Father, Son and Holy Spirit. Evan Roberts was a very humble man and wanted all praise to be given to God. The Roberts family grave (pictured left) is behind the chapel. Evan and his eldest sister Sarah were both single. 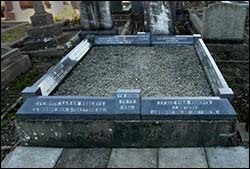 Their parents Henry and Hannah are also buried in the grave, along with siblings Dan and May. Dan went to America to preach the gospel and was buried here with his wife Lil. May was buried here with her husband Sidney. They had been missionaries in Cherrapunji, India, where Sidney became the principal of the Theological College. 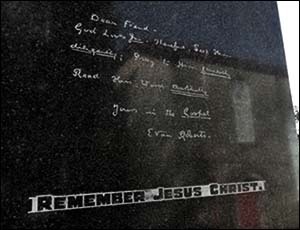 On the grave are also inscribed the words “Asleep In Jesus” and “Until He Comes”.